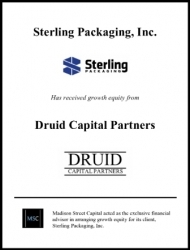 Chicago, IL, July 31, 2017 --(PR.com)-- International investment banking firm, Madison Street Capital, acted as the exclusive financial advisor in arranging a growth equity investment for its client, Sterling Packaging. Based in Selkirk, Manitoba, with expansion into Monroeville, Alabama, Sterling Packaging is a leading manufacturer of folding cartons that serves customers throughout the United States and Canada. The equity facility was provided by Druid Capital Partners. The transaction was announced today by Charles Botchway, CEO of Madison Street Capital. The transaction was led by Madison Street Capital Senior Managing Director, Jay Rodgers. Madison Street Capital is an international investment banking firm committed to integrity, excellence, leadership and service in delivering corporate financial advisory services, merger and acquisition expertise, financial opinions, and valuation services to publicly and privately held businesses. These services position our clients to succeed in the global marketplace. In undertaking each new project, the client’s goals and objectives become ours, ranging from financial advisory and successful capital raises to M&A transactions to transfers of ownership. Madison Street Capital views emerging markets as the core component driving the global growth of our clients, and will continue to focus significant assets on these markets. Our firm has earned the trust of clients around the world through our unwavering dedication to the highest levels of professional standards. For additional information, please visit our website and follow us on Twitter, and LinkedIn. Founded in 1989 and headquartered in Selkirk, Manitoba, Sterling Packaging designs and manufacturers folded paperboard cartons for a variety of industries including food and beverage, hardware, cosmetic, and pharmaceuticals. Its clients range from small, privately owned businesses to Fortune 500 companies in the U.S. and Canada. While it serves a range of industries, the company has established a solid foothold in the beverage industry, specializing in the manufacture of bottle carriers and beer packaging for craft brewers. For additional information about Sterling Packaging, visit the company’s website at www.sterlingpackaginginc.com. Formed in 2015, Druid Capital Partners is a boutique investment manager focused on investing in private companies in the Southeast, targeting specialty manufacturing, distribution, and industrial services. Druid Capital invests via majority acquisitions and recapitalizations in established companies alongside motivated, entrepreneurial owners and managers, providing a reliable, trusted, and local source of equity capital. For more information, please visit www.druidcapital.com.